Look, gentle reader! A finished object! Or objects, really, since there is a pair. These are my Andes Mints socks, made from wonderful, squooshy StitchJones Supersocks. The traveling-lace pattern is my own, made up on the fly. I’m sure it lives in numerous stitch dictionaries. I had knit a similar pattern in my Victoria Socks, but the lace only twists one way. With the Andes Mints socks, I wanted the lace to twist in opposite directions on each. I have to say I love knitting with this yarn. The colors are gorgeous and Sharon really nailed the repeat length, at least at this gauge. Although the stripes did change a little over the gussets, the colors never pooled or flashed! Love ’em, love ’em, love ’em. I can’t wait for cold weather so I can wear them. Well… that last isn’t entirely true. I will love wearing the socks, but will miss the warm weather. Falls here are so lovely, usually. By the way, if for some reason you have not yet heard of Sock Summit 2009, go over and get signed up for info. People in the know are calling this Woodsock. From the info I have – some of which I am not, unfortunately, at liberty to divulge – I can only say that this may very well be a once-in-a-lifetime, not-to-be-missed opportunity. And people wonder why I love living in Portland. We have more LYS per capita than any other city this size in North America (I think). And also more microbreweries. And tons of local indie dyers and spinners. And a bunch of vineyards. And an awesome fiber festival (OFFF). And locally made, hand-crafted chocolate. And then Sock Summit comes along. What more could one ask for? Yarn: StitchJones Supersocks (100% Merino, 100 gm/460yds per skein); one skein of Andes Mints. I had yarn left over. There would be plenty in one skein to do a man-size pair of socks. Hi Judy! I’m envious about Portland! These socks are so beautiful. I love the colors. I’ll be on the lookout for the pattern. I bought a skein of StitchJones in “Rock the Casbah” and I love it. 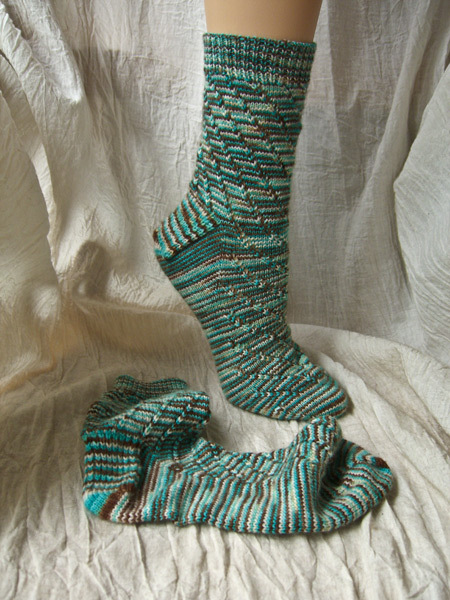 Haven’t worked it into a pair of socks yet, but it is on the list and this pattern looks perfect for my skein. Publish the pattern pretty please? I have that exact same yarn in Andes Mint & I love your socks. Three cheers for FOs! LOVE that pattern…would not mind having it, either! Holy cow! The summit committee alone makes me start drooling. I must say that as I read your description of Portland it started sounding amazingly like Asheville, NC. Add small town charm and you’ve got us, snuggled in the Blue Ridge mountains, no less. We don’t have as many yarn shops, but we don’t have as many people, either. If you ever come east, come see us. Truly! I went out to Tacoma, WA (inlaws live there) last May and would love to travel to OR next time we come out. Thx for the heads up on the Sock Summit. Now I have a target date for my next visit!!! I seem to have more to say! Love your socks. I’m wearing my own hand-knit socks today. So what? Well, it’s my third pair and the first that really fit. I swatched last night for another pair which will be toe up, begun with none other than Judy’s Magic Cast-on! Love it! Whoa, did I just have dinner at Olive Garden? Love the Andes Mint sox. The socks are so pretty. I hope you do make the sock pattern available. I love the name Woodsock!! I am glad to be living near Portland and don’t wanna miss it!